All transactions are safe and secure with a reliable history in online purchasing behind each of our associates. 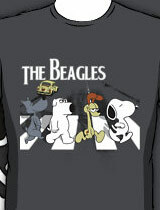 Buy The Beagles t-shirt to own Family Guy clothing and merchandise. Show your support for Brian in this Family Guy Beatles Beagles t-shirt that features the sophisticated canine with a few of his friends. Whether they're off to the Drunken Clam for a pint or taking a simple stroll through the city, these recognizable beagles are mimicking the Beatles Abbey Road album cover. It's not only a tribute to Brian from the Family Guy cartoon, it's also a tribute to Porkchop, Odie and Snoopy. These Family Guy t-shirts will have you humming your favorite Beatles tunes as you walk your own canine. In addition to The Beagles tee above, browse the Family Guy Clothing Gallery for more apparel like men's and women's clothes, kids shirts or hoodies.